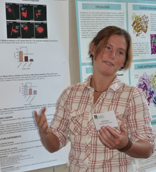 Michelle McNamara, a fourth year student in UVM’s Neuroscience Graduate Program presents her work in a scientific poster at the 2013 College of Medicine Graduate Student Research Day. The College of Medicine at University of Vermont is in the process of launching a new initiative, the BioSCOPE (Biomedical Sciences—Career Opportunities and Professional Engagement) Program, to better prepare their Ph.D. trainees in the biomedical sciences for the myriad of career options available in the contemporary biomedical workforce. BioSCOPE will focus on providing trainees with the Information (through interaction with invited speakers from various non-academic sectors such as biotech, pharmaceuticals, policy, communication, technology transfer, etc…), Experience (through 4-8 week externships at local and regional biotechnology sites to gain first-hand experience in the biomedical workplace outside of academia) and Mentorship (through one-on-one interactions between trainees and external mentors in the biomedical workforce outside of UVM), required to better prepare them for their careers and to make informed decisions about their career choices. Dr. Christopher Berger, Director of Graduate Education at the University of Vermont College of Medicine, will be spear-heading the development of the BioSCOPE Program and has just submitted a five-year, $1M grant proposal to the National Institutes of Health for one of their limited competition BEST (Broadening Experiences in Scientific Training) Awards. While the proposal won’t be reviewed until the Fall, Dr. Berger is planning on moving forward with the BioSCOPE Program regardless of whether the award is funded or not, and is looking for local and regional partners to participate in providing mentoring and externship opportunities for College of Medicine trainees outside of the traditional academic setting. For additional information please contact him directly at cberger@uvm.edu or (802) 656-0832. A recent article in the Vermont Tech Jam newsletter profiles Mercedes Rincon and her patent for an antibody with potential uses for cancer treatment. If you haven’t seen the article yet, it’s an interesting read, plus a VBSA get together is mentioned as the catalyst for commercialization of Dr. Rincon’s antibody. The College of Medicine recently launched their new SPARK pilot grant program. The idea is to provide small grants to researchers with ideas that can move quickly “from bench to bedside”. Download the UVM College of Medicine’s quarterly magazine, The Chart, here and turn to page 5 to read the article.